The OneSource IoT unit is a medical grade, device compliant with UL 60601-1 3.1. OneSource IoT is a hardware device that enables physical and logical data transformation from proprietary and non-standardized protocols, to be collected and transformed into a standardized dataset. It also serves as a security and functional layer around the medical devices. As it has all the protocols implemented locally, it does not suffer from data loss if the network is temporarily or otherwise, unavailable. It is equipped with a battery and can be unplugged for up to 6 hours on a fully charged battery, such as during transfer, or unforeseen power outages such as accidental connector detachment or temporary power failure, with full operational readiness. The software is to be ideally installed on the OneSource IoT Virtual Machine that runs a 64-bit Linux OS. Memory and storage are tuned for number of bedside OneSource IoT devices and medical devices attached. During a typical 24 hours, patient monitors, anesthesia machines or ventilators and EEG monitoring – BIS monitor and a few IV pumps will typically create 1 GB of data, typically with 60-85% compression ratio, resulting in a 150-400 MB encrypted repository for complete, high frequency datasets, including waveforms. For an average 10 hours of OR usage per day, or 24 Hours ICU Monitor per patient, the 24 hours encrypted, and compressed storage are expected to be in 80-120 MB range per bedside location. Storage space dedicated to OneSource Integration Server should be 50 GB per year per bedside location. A 2 TB storage space should be enough for 4 years of 20 bedside units. Near real-time waveforms, tabular data view and historical data is served from the unit that has the data, which is typically the OneSource Integration Server closest to the source of the data, or sometimes the OneSource IoT directly. The memory used per viewed session is about 10 MB per viewer, so 1 GB dedicated memory will serve 100 contemporaneous viewers. A local or ward level OneSource Integration server should have a minimum of 2 GB of RAM and 1-2 CPUs, while a central OneSource Integration Server should have 8-16 GB of RAM and 4-8 CPUs to be able to serve over 1000 viewers concurrently. 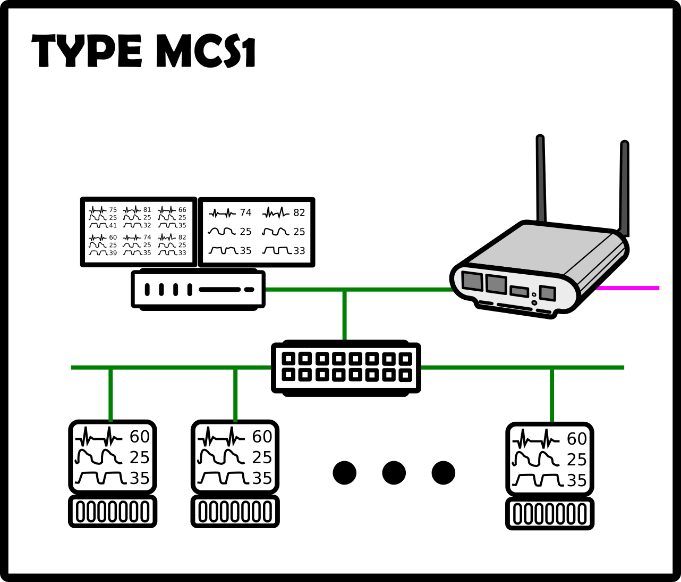 TYPE MCS1: The OneSource IoT or OneSource IoT VM is connected to the Network HUB that repeats all the network messages originating from and to the central station. This is the best method for data acquisition. Possible single data frame errors may occur, and sporadic messages might be lost due to HUB bandwidth limitations. This condition of possible, sporadic, frame loss is common in this deployment type. 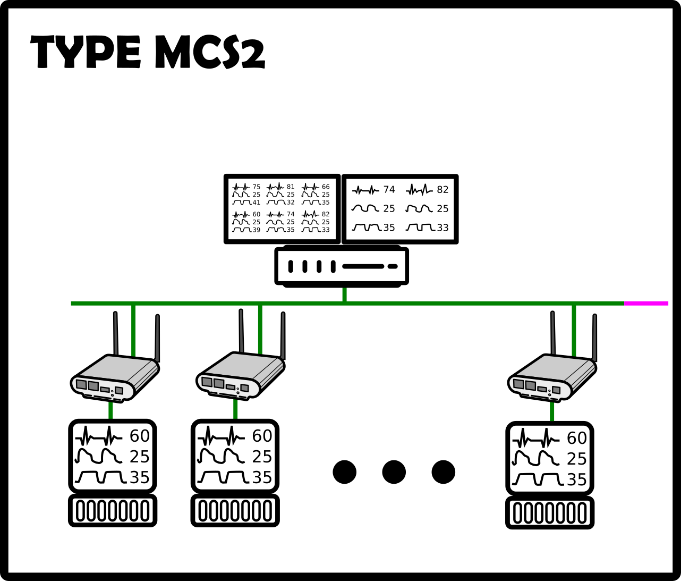 TYPE MCS2: The OneSource IoT act as a switch and is connected BETWEEN each monitor and the central station. The monitor can be reached as it is on the network, and no data is filtered out. 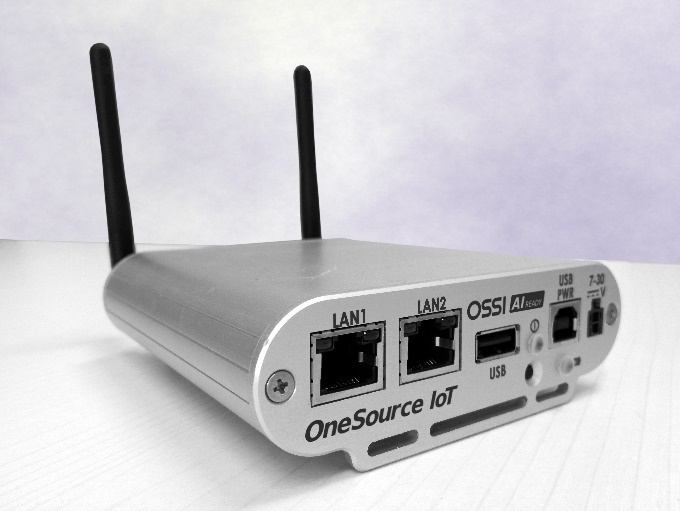 The OneSource IoT acquires its IP address from the network and connects via the same Monitoring LAN. The risk associated with a possible hardware or power failure to the OneSource IoT device is limited to the monitoring station, and not to the whole group of centralized monitored locations. In the case of IoT failure (reported on the OneSource Connectivity dashboard), simply unplug and plug in the network cable to the patient monitor, or replace the failed unit, and data flow will be restored. 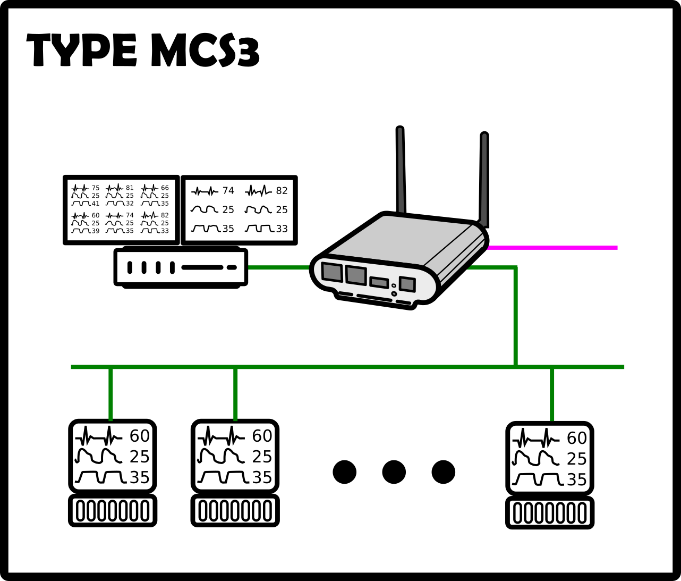 TYPE MCS3: The OneSource IoT is connected BETWEEN the Central Monitoring network and the Central Monitor. This choice reduces the need for additional OneSource IoT hardware, but it creates a potential single point of failure, even if OneSource IoT hardware is specifically designed for 24/7 continuous operations. 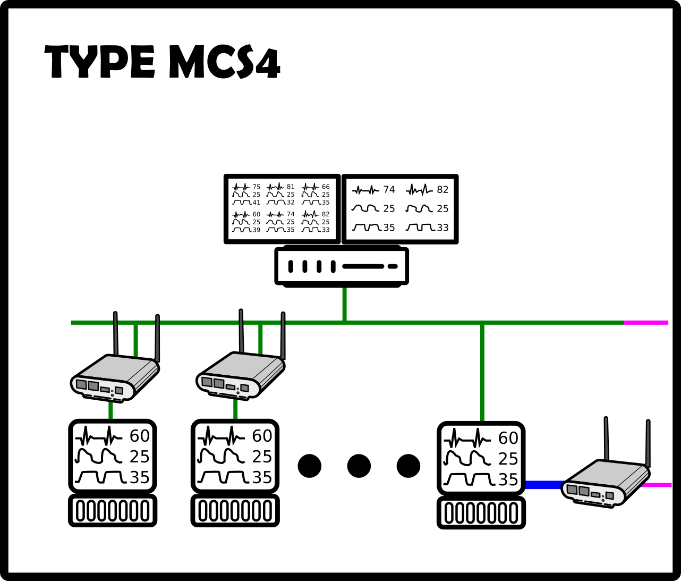 TYPE MCS4: The OneSource IoT acts as a switch and is connected BETWEEN each monitor and the central station, except in one or more case where devices are connected through Serial or USB. All the Patient Monitors can be reached as if they are on the network, and no data is filtered out. 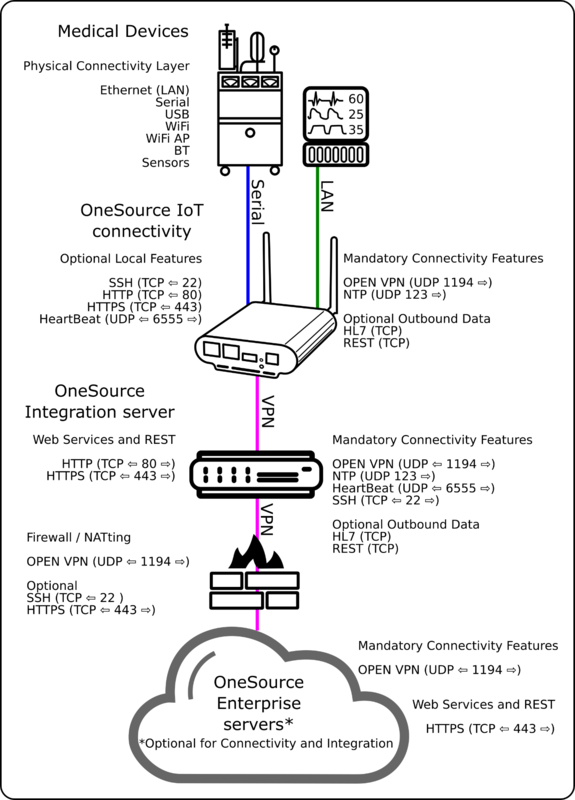 The OneSource IoT also acquires the IP address from the network and should be able to reach the data network from the same Monitoring LAN it is connected. The failure risk is limited to monitoring station and not to the whole group of centralized monitored locations. 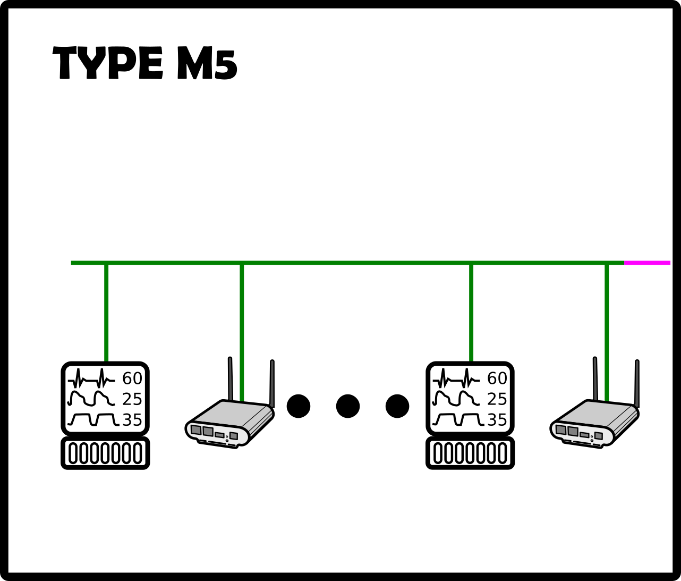 ONE or more monitors are connected as before and can be used for operativity check. 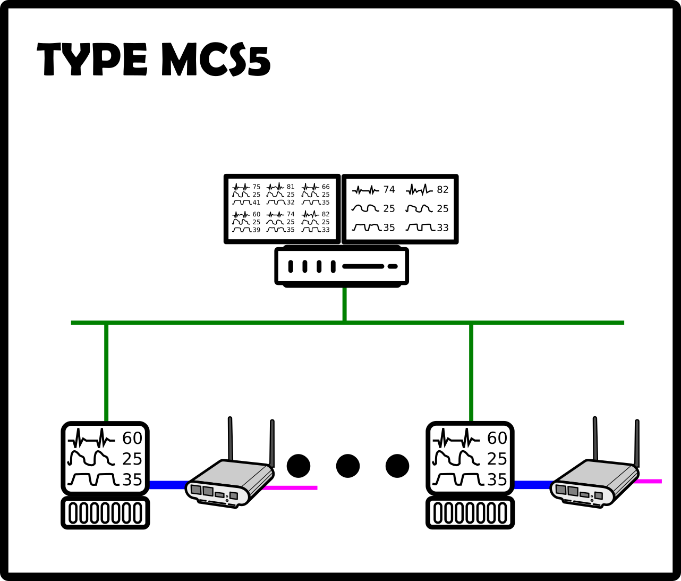 TYPE MCS5: The OneSource IoT are connected in parallel through Serial, Additional LAN or USB to the Patient Monitor, and collects the data independently from the Central Monitoring Station. This method may require the Medical Equipment to be upgraded with add-on cost. 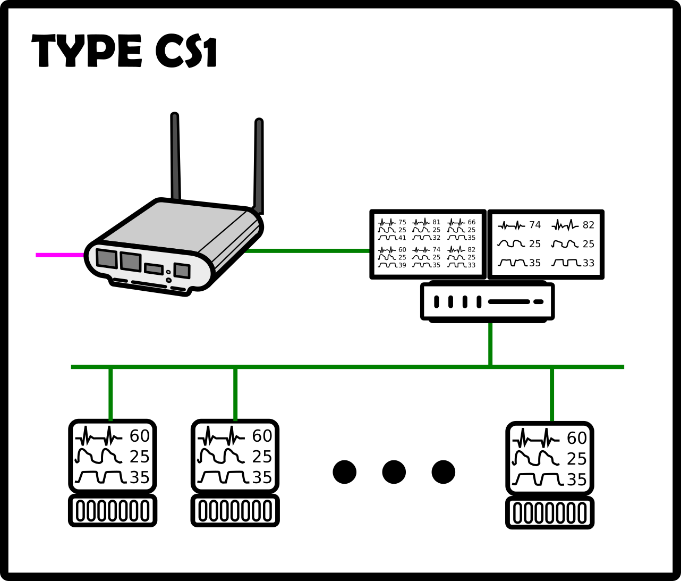 TYPE CS1: The OneSource IoT is connected to the Central Station and not to individual medical devices. This deployment method and connection is the worst in terms of data collection, as it depends on the Central Monitor features, functions, and availability. Important data limitations, in both frequency and functionality have been observed in previous implementations. 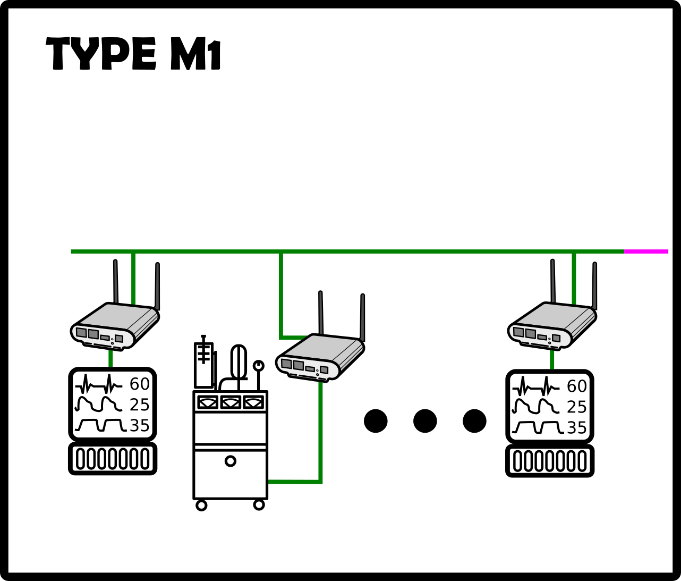 TYPE M1: The OneSource IoT is connected to the Network, and the medical device to the LAN port of the IoT device. Both IoT and Medical devices are present on the network as the OneSource IoT acts as a switch. 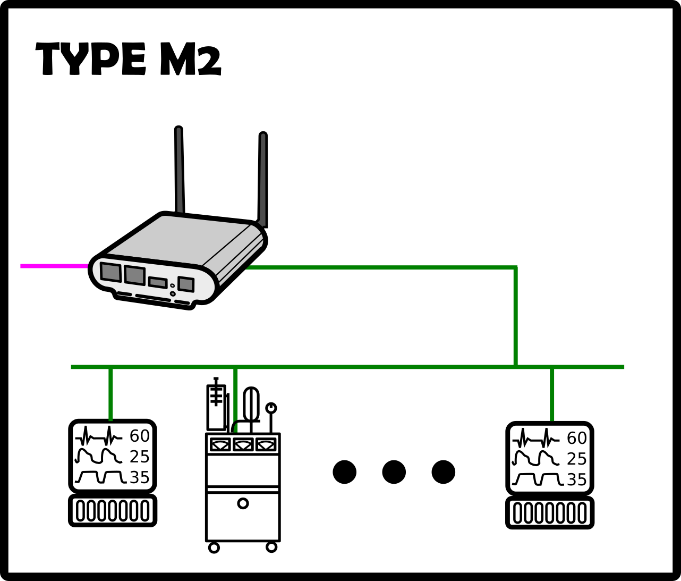 TYPE M2: The OneSource IoT is connected to the same LAN network with different medical devices. This is possible only on LAN enabled medical devices. 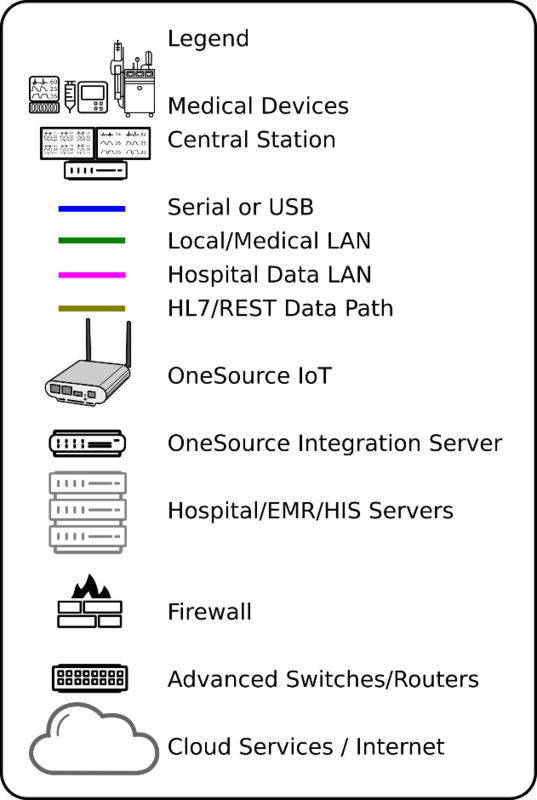 TYPE M3: The OneSource IoT is connected to the network, along with others medical devices or IoT devices. The data network is connected to the second port of the IoT device. Normally one IoT device is used per bedside location and serves as a Location Identifier and patient data aggregator among different devices. 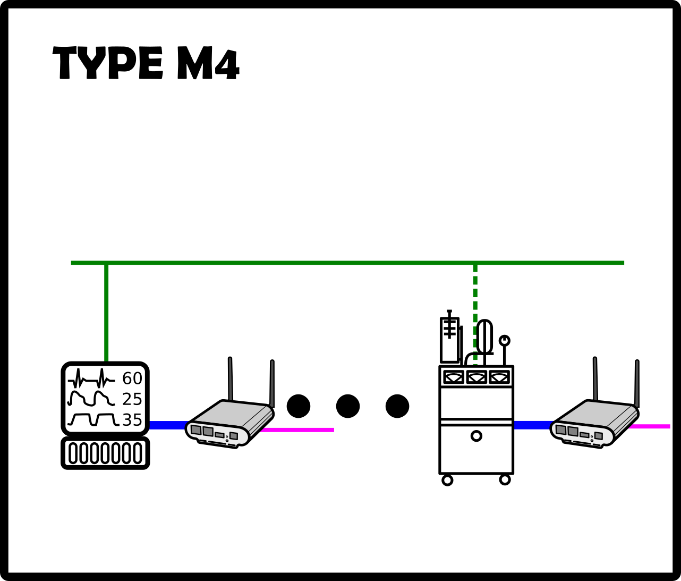 TYPE M4: The OneSource IoT is connected to the data network and is connected directly to the medical device via serial or USB connection. This, and M7, are the BEST and most common deployment and connection option. TYPE M5: The OneSource IoT is connected to the network, along with others medical devices or IoT devices. Data Network is available from the same LAN port where the medical devices are present. Normally, one IoT device is used per bedside location, and serves as a Location Identifier and patient data aggregator among different devices. TYPE M6: The OneSource IoT is connected to the data network, along with others IoT devices. 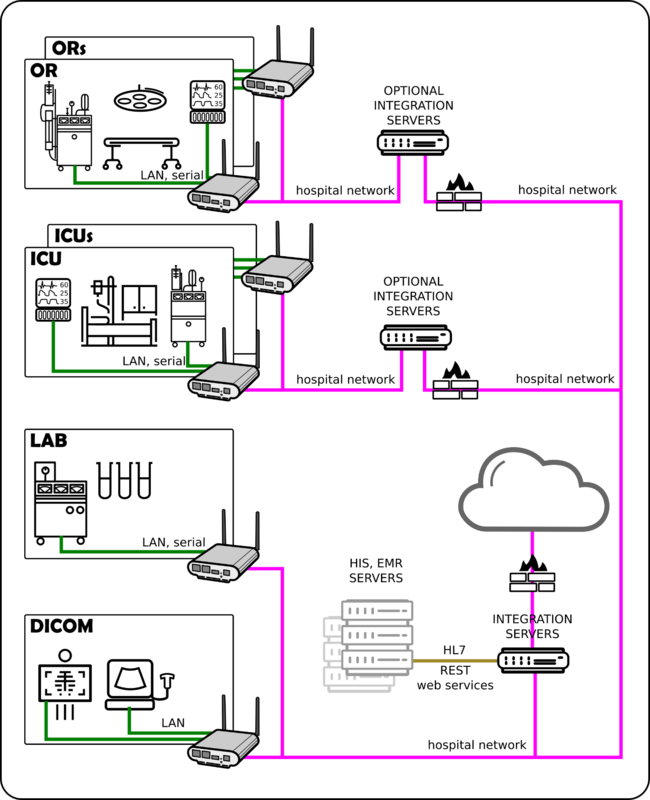 The data network is available from the same LAN port where the medical devices are present. 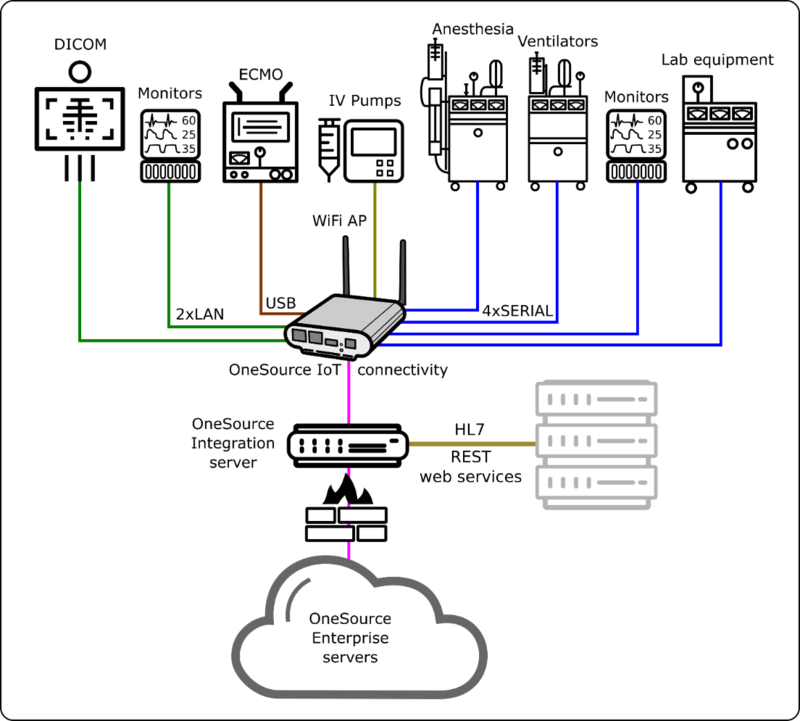 The OneSource IoT is connected with the medical devices via one-to-one connections from serial, LAN or USB. Normally, one IoT device is used per bedside location and serves as a Location Identifier and patient data aggregator among different devices. 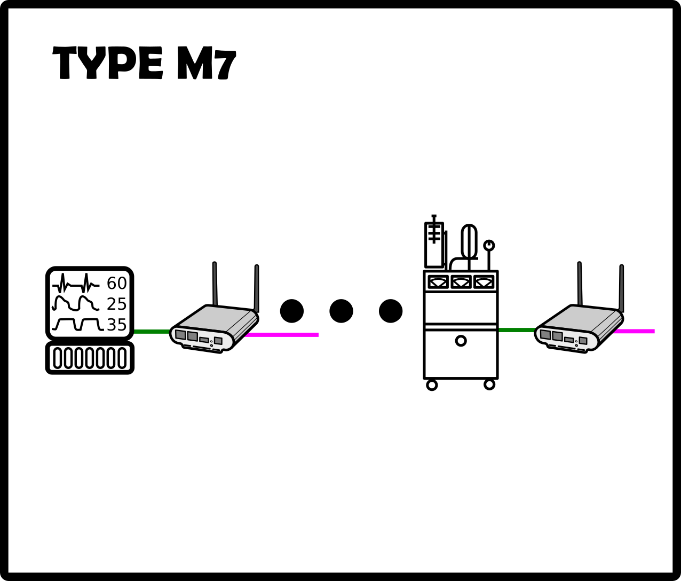 TYPE M7: The OneSource IoT is connected to the data network and connected directly to the medical device via a one-to-one LAN connection. This, and M4, are the BEST and most common deployment and connection options. 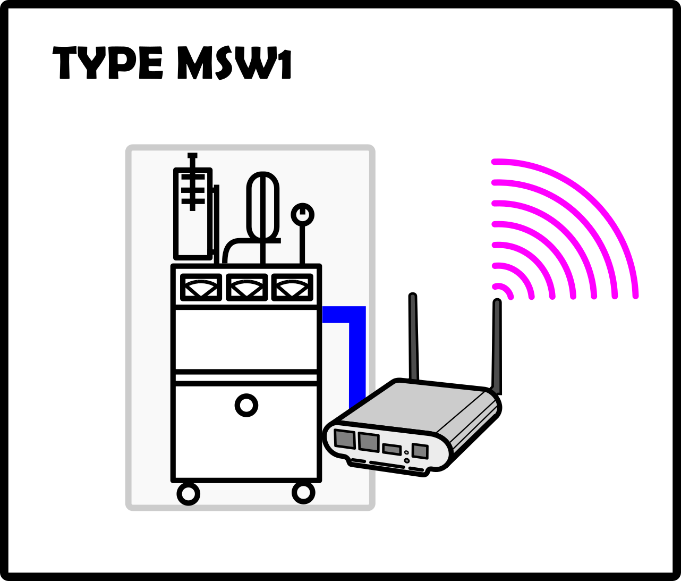 TYPE MSW1: The OneSource IoT is connected to the wireless network, and to the medical device via serial or USB; it is then powered (plugged-in) from the medical device. The OneSource IoT has an internal battery capable to sustain the operativity for up to 6 hours and automatic Power On capability, so it can gracefully shut down and power up when the medical device is powered back on. 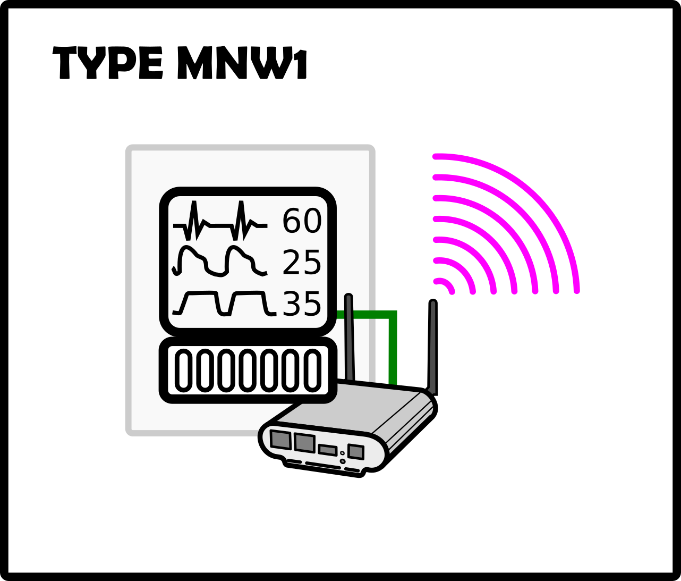 TYPE MNW1: The OneSource IoT is connected to the wireless network, connected via LAN to the medical device and powered (plugged-in) from the medical device. The OneSource IoT has an internal battery capable to sustain the operativity for up to 6 hours and automatic Power On capability, so it can gracefully shut down and power up when the medical device is powered back on. 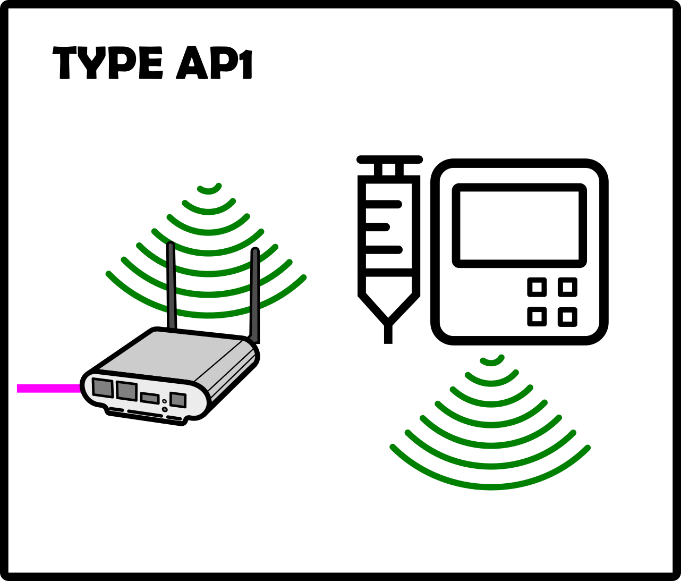 TYPE AP1: The OneSource IoT is configured as a Wireless Access Point, as an independent network or subnet (acts as a router) or as an extension (acts as a repeater) of the wireless network.